Intended open abdomen is an option in cases of trauma and non-trauma patients. Nevertheless, after primary closure, incisional hernia rate is high. We describe a novel method, called COmbined and MOdified Definitive Abdominal closure (COMODA), a delayed primary closure which prevents incisional hernia. A negative pressure wound therapy system is combined with a condensed polytetrafluoroethylene (cPTFE) mesh. Trial registration: ISRCTN72678033. Ten male patients with a median age of 68.8 (43–87) years were included. Primary closure rate was 100% per protocol. The median number of procedures per patient was 5.7 (5–9). Primary closure was obtained in 20.8 (10–32) days and median hospital stay was 36.3 (18–52) days. 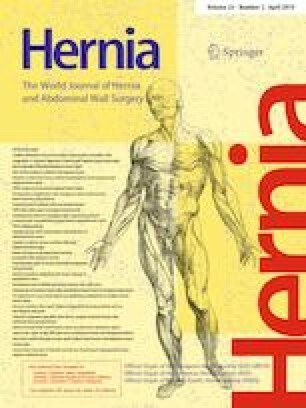 Only one patient developed incisional hernia during a median follow-up of 27 (8–60) months. COMODA method allows for a high rate of delayed primary closure. It is safe and decreases the risk for developing an incisional hernia. However, a large number of patients are needed to support this conclusion. The authors of this manuscript have no conflicts of interest to disclose. RV declares no conflict of interest. YM declares no conflict of interest. MM declares no conflict of interest. CG declares no conflict of interest. GP declares no conflict of interest. AE declares no conflict of interest. JO declares no conflict of interest.